The Tissot V8 is one of our favourite men's watches. 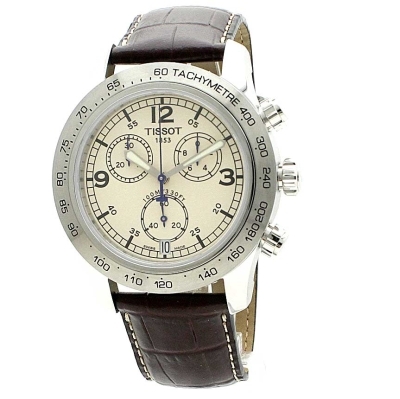 It has an ivory colour dial and a perfectly contrasting brown leather Tissot strap. Features a tachymetre bezel, and has beautifully styled buttons to operate the swiss chronograph movement. The engine of the Tissot V8 series is a quality Swiss movement, signalling the celebration of a long-standing, passion-filled relationship between Tissot and motorsports. After months searching for the perfect watch for my hubbys 40th i finally found THE ONE on watch shop, the TISSOT V8 chronograph and what a gorgeous watch it is with its cream face, chunky stainless steel case and brown real leather strap its true class and so masculine, it keeps perfect time and hubby says its really comfortable to wear he absolutely loves it and has loads of compliments and to top it off it came in a lovely box with lots of compartments containing the guarantee, Manuel, catalogue and a book on the history of TISSOT which is extremely interesting it also has a special cleaning bag as well i just cant rave about this watch enough and totally recommended to anyone looking for the perfect watch. I bought this watch for my sons 18th birthday. I have bought 2 previous Tissot watches from the Watch shop and have been very satisfied with excellent service. I ordered the watch online and it arrived a matter of hours later the very next day. This is the kind of superb service I have come to expect from a premier company like the watch shop. The watch arrived well packaged and when opened looked superb in the lovely Tissot presentation box. I have never before seen quality like it in other brands. The watch is super looking and features a full chronograph function. My son particularly wanted a brown leather wrist band and this watch is fitted with a very high quality strap. He was delighted with his present and wears it with pride on special occasions. I would recommend this watch to any potentail purchaser and I would recommend the watch shop for their superb customer service to any body wishing to purchase a quality timepiece. A great watch, looks and feels good quality. Very good value for money. Well presented and good, quick service. Would recommend! The watch arrived quickly in non-descript packaging perfect as it was a gift for my fiancé on our wedding day. The watch strap was a little darker than I was expecting but nevertheless very nice and seemed of good quality. The watch box was a little scuffed which was disappointing because the watch itself was absolutely fine. Overall, I am pleased with the purchase but wished that the box had arrived without a mark. Great purchase. Really pleased. Exactly as advertised and great quality. I do really like this watch for this unique old fashion design, big numbers visible time gadgets with neon straps inside of it. What I dont like so the leather stap because is squicking so much when move your wrist. And also smells a bit when wet. It has a data, tachometer and some other features I dont really know : the shield in side is creamy nice silver ring around with some digits around it and nice brown leather straps with make a noise but looks nice. I love the watch I bought, it is very comfortable and sits nicely on my wrist. The colour and style is a little understated but still looks like the quality you would expect from a brand like Tissot. Im very pleased with my Tissot V8. It is everything I thought it would be when I searched the Watch Shop site for the best deal. I opted for ivory face version which comes with the leather strap which I did have concerns about but the quality and fit is excellent and its cheaper. You know its a quality watch just by its feel and it looks fantastic. Couldnt be happier. Really pleased. Looks classy and has a real quality feel. This is of course no surprise as its Tissot. After only two weeks the covering material on back of leather strap had already started to lift and peel away on both sides where it is fixed to the watch. Also the surface where the buckle fastens is cracking and coming off. Discovered the sweep hand will not reset correctly. Not had these problems with a similar Seiko watch which is over 4 years old. Tissot advertise their products as quality items for active people? The watch has not been subjected to any abnormal treatment or dropped just normal day to day wearing. It would be better if Tissot spent less on presentation box & history book and improved watch quality. Fab product from a fab company. Looks very good on the wrist. Highly recommended. Delivery was prompt and exactly as stated. Watch is of a great quality and everything I expected. The watch is beautiful. It really looks good, the watch looks better in on the wrist than in pictures. I like the dial colour, its a good size and is very legible. The bezel is a tad wide, which makes the watch size close on 42mm and looks good on the wrist. Finishing of the case clean and neat as you would expect from Tissot. The strap not only feels sturdy but also looks great. The date display is a little small. Overall, a good looking watch at a GREAT price. Ive have spent some time researching similar style Swiss watches and have to say the Tissot V8 wins hands down! For me, it was the classic sports car inspired ivory coloured face design, high quality sapphire crystal glass and brown leather strap makes this a winning combination. It has a chunky, high quality feel that is usually only found in Swiss made watches that cost several hundred pounds more than this watch. Highly recommended - you will not be disappointed! The watch itself was good. However I paid extra to have it professionally wrapped and it still had the price tag on..
Beautiful watch, classy looking but modern at the same time. The packaging and box makes it a real gift. The perfect gift for my husband to be. Extremely pleased with my first Tissot watch. I have been looking for a new watch for months and this fitted my requirement. The leather strap is good quality and has a traditional "buckle" which is stamped with the "Tissot" name, a very nice touch. This watch can be worn with a suit or casual on a night out. Lots of positive comments from family and friends. -meets all criterias that I was looking for in a watch. The Tissot V8 really is a good looking gents watch that portrays thorough quality and craftsmanship. 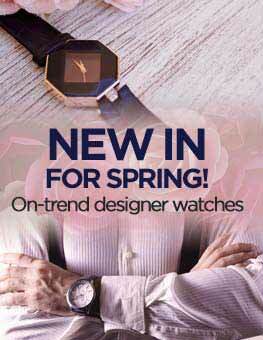 The watch is comfortable, easy to use and is a great everyday accessory. I spent ages looking for this watch! I wanted something that was casual, but at the same time could be worn at work. It had to be smart and easy to use / read. The brown strap really suits the cream and chrome finish. I was a little unsure at first but having worn the watch for a few weeks now it seems to work well. I bought this watch for my husbands birthday and he loved it. Watch face is really clear and not fussy. Watch looks a lot more expensive than price paid. The Watch Shop provides an excellent service, received watch on date as stated in email and txt message. No hassel all very straight forward. Fantastic and affordable elegant watch. Other brands offer these features at almost double the price. This is a fabulous watch! Its a very good size and not too big either. The strap is incredibly smart and it looks to be very hard wearing. I like the ivory face to the watch more the other versions which have white and black faces but I guess thats just personal choice. The face is not too fussy and has all the features you need to make it interesting but not overwhelming. Highly recommended! Fast delivery even with the weather. Watch as described. Very pleased and would recommend to others. Very nice watch, fully satisfied with the services. I like the combination of leather and metal, great packaging. This is a stunning piece, absolutely ellegant watches, beautiful shape and modern design. The watch has its charm and elegance which Tissot is known for.I love the dial and strap of the watch, feel very comfortable to have on your wrist. I have purchased this for a present so the recipient has not seen it yet! However it looks a very sturdy, classy watch with a really nice brown leather strap. Beautifully presented box with instructions and gift bag. Delighted with it. The watch looks lovely,it is a Christmas present so I hope my partner likes it. The strap looks a bit small but I hope once it's warn in it will be fine! I researched a lot of watches and decided this was the best all round buy. Overall I am very pleased with the design and quality of thi watch and the service from the watch shop Delivery was quick and the item came well packaged in a beautiful presentation box so no need fir wrapping! I really like that watch. Very sylish and good looking! Makes my wrist look very good! These Tissot watches are very beautiful. It has a large dial and simple functions. It is a valuable quality piece for all occasions. My wonderful wife bought me this watch as a birthday present. Firstly, the service from Watchshop was first class -a reassuring text message confirming the watch has been sent, followed by exceptionally quick delivery. The watch itself was very nicely presented, in a hard box, with a Tissot book and all instructions packaged nicely. The watch itself is superb. If you want the sporty look go for the black strap / white face V8, but I preferred the more professional looking brown strap / cream face version. I havent really explored the chronograph features fully but the watch feels great - solid but not too heavy, looks great - it gives me confidence, and works perfectly - as you would expect. I have no complaints about the stiff strap, it softened up around my wrist in a couple of days and is very comfortable. This watch is amazing value for money and I would thoroughly recommend Watchshop and Tissot to anyone. the watch itself is gorgeous but the strap it came with was very small, smaller than average and definately smaller than the same watch that we viewed in the shops. Fantastic watch, looks great and feels great. For the price, I would say it's by far a better quality watch than the designer watches and on a level with the other £400+ swiss made watches. First impressions. The V8 arrives in a very nice presentation box that exudes quality. I wanted a good looking, functional watch without hundreds of fancy gadgets and useless functions, which is exactly what i got. Beautiful brushed steel case and nicely stitched leather strap with embossed buckle. I would say the colours on the website are a fair rendition of the watch in reality. The watch case itself is quite large, and i have quite skinny wrists but i can still easily pull it off, so dont be discouraged if you also suffer from girl wrists! The chronograph function is easy to use, im not sure why people are complaining about the instructions, they seem to adequately explain the limited functions of the watch. All in all, i am very pleased with this watch and would recomend it to anyone. Hi 4rnds !!! This watch is really awsome it's speciality is it's can b worn at all the times ex:work,casual & party as it has all the looks u need.I m using it 4r 6 to 7 months it's koolll..I give 10/10.so go for it now..BECAUZ THE CHANCE IS NEVER LOST SOMEONE WILL PICK IT...IF U LOSE IT!!!!!!!!!! I am impressed by the quality that has gone into the build of this watch. I have owned various watches including Rolex's and Omega's and can honestly say I am unsure where the extra money goes on these high end brands. I know it is not an automatic movement but the materials used and detailing mean that it is punching way above it's price point. The watch is great. My dad loved it. It is big and heavy enough for a man. Very classy colours and materials. Face might be slightly too busy. I got this for my boyfriend and he loves it. The delivery time was very short and without complications. I cannot fault the service or the watch. Fast delivery and an excellent product. Niece wiegt, depth and diameter. Beautiful brown leather strap, soft inner for comfort, neat 'Tissot' engraving on buckle. Distinct cream facia, sophisticated chronograph features with classical letters and ornamentation. Looks fantatsic, a good balance of technology and classical chic. Dislikes: Poor users manual (have to visit Tissot website where the manual recommended does not match exactly the V8). Usert manual is difficult to follow, still haven't figured out the chronograph feature. I`ve just received this watch and I`m very pleased with the quality and the look of it. The service from Watchshop UK was fantastic, very prompt delivery to any EU country. The watch itself looks even better than on the picture. It has a great looking ivory dial which matches perfectly with the steel of the bezel and the brown leather strap. The strap is a bit stiff at the moment, but I`m sure with time it will soften. Also good weight and case width – the watch feels and looks elegantly big. I`ve owned another Tissot for a couple of years now, and was looking for something new this time, which catches the eye of today`s individual. I`ve found the V8 and think it`s one of the best choices in its price range, if you`re looking for a quality watch. 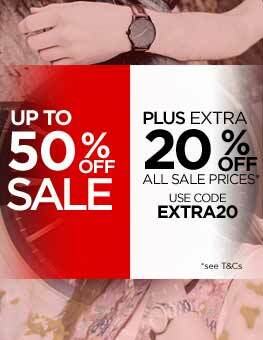 For less than £200 you’ll get a stylish sporty watch together with the Swiss quality. 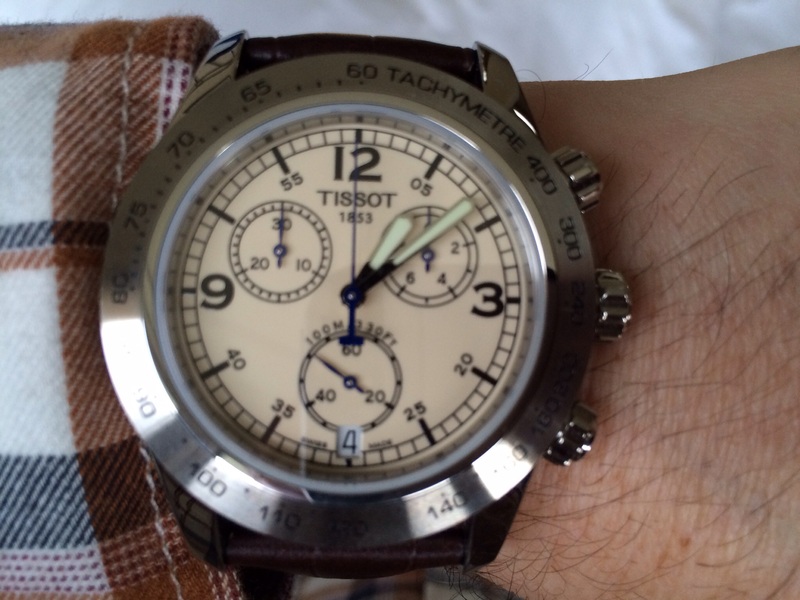 I would highly recommend the Tissot V8 Chronograph Watch and Watchshop UK to anyone! 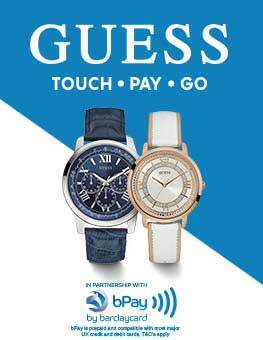 Watch Shop provides an amazingly high fidelity online shopping experience. What i saw on the screen was exactly how the watch looked like in reality. I am truly delighted with the order process at Watch Shop. The watch was delivered as promised before 1pm on the next working day. 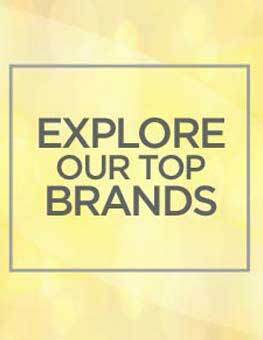 Strongly recommend Watch Shop as it scores well on product range, price and delivery. Tissot is a very well known brand that’s been on the market for quite some time and I think there is no need to introduce it to anyone. Reviewed here V8 is part of the Tissot’s T-Sport collection. It’s a classic stainless steel watch with chronograph and date dial functionality with up to a 100 metres water resistance (although the crown is the push-in type). It’s brown leather strap with contrasting Breitling-style stitching perfectly composes with ivory dial and the steel of the bezel. It comes with an excellent presentation box (you can see it and all the contents if you click on “Supplied with”, it looks much better than on that photo though). You also get a sack for the watch in case you would decide not to wear it on your wrist ;). But what makes a good watch? For me, there are few things to consider – precision, functionality and build quality. To start with accuracy, V8 is quartz operated so generally it is more precise than a mechanical watch. Although it is not certified by the COSC (the Official Swiss Chronometer Testing Institute), as long as you don’t want to use it as a scientific instrument it is perfectly fine and depending on the working environment it will give an accuracy of around +/-1 second per day and if you’re looking for a watch doing better than that you should be looking in a different price range. When it comes to functionality I am quite pleased. Clear, not too busy dial (not like in many other chronographs) with a date dial placed at 6 o’clock position is very easy to read due to the design of markers and wide hands which are illuminated for hours after being “charged” by an external light source. Current time seconds are shown on the bottom sub-dial. Time and date are set by two traditional pull-out positions of the crown. There is also a tachymetre on the bezel which can be used to measure speed on a given distance, rate of production etc. So far it wasn’t of much use to me and I don’t think it will. I can think of some other, more practical things that could have been there instead. I guess Tissot wanted to be consistent in the sportish design as this is the T-Sport series watch which corresponds to Tissot’s involvement in motorsports events. As for the chronograph, it has add and split time functions but only one can be used in a single time measurement (you have to reset it to use the other). The two sub-dials are reasonably placed but sometimes can be difficult to read if they are covered by the bigger minute/hour hands. They indicate minutes and multiples of 0.1s. Seconds in time measuring mode are shown on the main dial. Two chronograph operating buttons are rather soft and give just enough resistance so you can’t push them by accident. In terms of build quality it is an excellent choice. All the parts look very solid and durable. The face of the watch is made of very hard sapphire crystal which is colourless and perfectly transparent. Theoretically it can only be scratched by diamond but you need to forgive me but I haven’t tested it . The case is made of high/medium polish 316L stainless steel. Besides all that you can see “Swiss Made” label on the dial and it means that Swiss manufacture of the watch movement account for at least 50% of the total value (without the cost of assembly) and it was cased up and tested in Switzerland. My only concern here is the strap - I’m not sure if it will last that long as you will bend it in the same place every time you put on/take off the watch. I have this watch for over 2 months now and I am very happy with it, there’s nothing much to complain about. It was quite uncomfortable in the beginning due to the leather stiffness but it softened after about two weeks and now it’s perfect. Before buying it I only had a chance to see it on the internet but it met my expectations. The only differences were the strap and the blue hands which are actually darker. That’s why I made a few pictures and the goal was to represent the colours it the most accurate way. I would definitely recommend this watch for people looking for a chronograph but keep in mind that it's quite bulky so if the size or the weight of that watch might be a problem for you, ask yourself if you really need a chronograph as the ordinary timepieces can be much smaller and lighter (like the titanium ones). Also some Japanese brands offer more functionality at that price range but, again, here you’re paying for the Swiss quality and materials (like sapphire crystal) which, in case of this particular watch, come at a very good price anyway. The watch is really impressive. It looks beautiful and the delivery service was really prompt. The only drawback i would have is where the strap connects to the face. The edges are quite sharp and can be slightly uncomfortable at times. Overall a great looking watch. Excellent service!! I ordered my watch on the morning of 23rd and the next day at lunch time it was in my house in Lisbon, Portugal. 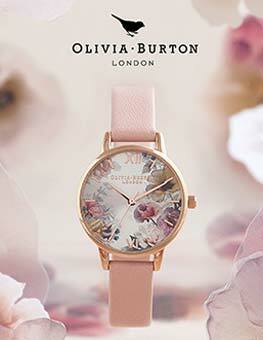 The watch is beautifull and the person who received loves it! Great machine with classic/modern design. Not to mention the box, already makes the gift beautifull! I will use your shop again. Definitely five-star service. Ordered my Tissot V8 on Saturday afternoon and it arrived before 9 am on Tuesday morning without paying extra for delivery. Top class. As for the watch, well it is certainly a handsome beast and the presentation box is a work of art in itself. Think I might must keep the box and throw the watch away!! NO CHANCE. Although it is at the low end of the Tissot range is looks a million dollars and I shall wear it with pride. Just one minor down-side - the tiny instruction manual hidden in one of the drawers of the box does not give precise operating instructions for my specific watch! And I still haven't worked it all out yet, but I am sure I will. The official Tissot website offers the same instructions, so no luck there. Any suggestions? I love Tissot watches. I bought my first, an F1, over 25 years ago and still going strong it cost a lot of paper round money and I have just bought my second, the V8 from watchshopuk. It is a fine watch, supposedly based upon the dials found in a classic British sports car. It is a large, bulky watch, so worth checking the measurements first, but I love it. Very classy and elegant with a comfortable strap, if it lasts as long as my F1 it will bring much pleasure for many years. First rate service from watchshopuk, I can confidently recommend them on price and delivery. Excellent service and a great watch. Will definitely buy again from this site. Tried this site following a recommendation from a close friend and found it to be very satisfactory.